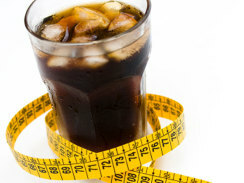 Welcome to Linda Ikeji's Blog: Study: Diet soda increases the risk of diabetes. Why do we still drink this stuff? Yet another study confirms what people have been saying for ages: Stop drinking diet soda. Like, right now. Drinking just one 12-ounce can of an artificially sweetened fizzy drink per week can increase your risk of Type 2 diabetes by 33 percent, French researchers found, and given that most people don't stop at a single weekly serving, your real risk for diabetes could actually be much higher. The study, which was announced Thursday and will be published in the American Journal of Clinical Nutrition, was conducted by France's National Institute of Health and Medical Research and covered 66,118 middle-aged women whose dietary habits and health were tracked from 1993 to 2007. The results were unexpected. Though it's well-known that people who consume a lot of sugar are more likely to develop diabetes, the researchers found that participants who drank "light" or "diet" soft drinks had a higher risk of developing Type 2 diabetes than those who drank regular, sugar-filled sodas. Those who drank 100 percent natural squeezed fruit juices instead had no additional risk. Women who choose artificially flavored soft drinks usually drink twice as many of them as women who choose regular soda or juice -- 2.8 glasses per week compared to 1.6 glasses. "Yet when an equal quantity is consumed, the risk of contracting diabetes is higher for 'light' or 'diet' drinks than for 'non-light' or 'non-diet' drinks," the researchers, epidemiologists Francoise Clavel-Chapelon and Guy Fagherazzi, said in a statement. Women who drank up to 500 milliliters (about 12 ounces) of artificially sweetened beverages per week were 33 percent more likely to develop the disease, and women who drank about 600 milliliters (about 20 ounces) per week had a 66 percent increase in risk. Drinking sweetened beverages increases the risk of becoming overweight, which is itself a risk factor in developing diabetes. But the study didn't found that the results were the same even among overweight women. So how can artificially sweetened drinks be making the problem worse if they're fat- and calorie-free? "With respect, in particular, to 'light' or 'diet' drinks, the relationship with diabetes can be explained partially by a greater craving for sugar in general by female consumers of this type of soft drink," the researchers explained. "Furthermore, aspartame, one of the main artificial sweeteners used today, causes an increase in glycaemia and consequently a rise in the insulin level in comparison to that produced by sucrose." Translation: Drinking artificially sweetened drinks makes you crave other sweet things (hello, chocolate!). And your body reacts to aspartame -- also known as NutraSweet and Equal -- much in the same way that it reacts to plain old sugar. According to the American Diabetes Association, about 25.8 million children and adults in the United States have diabetes -- about 8.3 percent of the population. The disease is the leading cause of new cases of blindness in people age 20 and older, and can also causes heart disease, stroke, high blood pressure, kidney disease, and damage to the nervous system. Type 2 diabetes -- which can be controlled by diet and exercise rather than a daily insulin injection -- is the most common form of diabetes in the United States. The study's authors cautioned that more research was needed in order to prove a true causal link between diet sodas and Type 2 diabetes. "Information on beverage consumption was not updated during the follow-up, and dietary habits may have changed over time," they admitted in their report. "We cannot rule out that factors other than ASB [artificially sweetened beverages" are responsible for the association with diabetes." Generally, it's much better we reduce significantly the sugar we consume. But I see not much difference between diet coke and the main coke. Linda keep things like this coming. Apart from the fact that these drinks might not actually be sugar-free as they make us believe, I think they add addictive substances to them and this makes it very difficult not to exceed once a week serving. Those that want to take heed to advice should, those that won't can continue sipping their life away. Hope dis news is not sponsored by pepsi.? Ok thank you linda you don try. not just diet coke, consumption of our local soft drinks is also bad. We get sugar from our rice, yam, garri etc, so why take all des drink. Pls can any dietrician or nutritionist in the house confirm the status of the new low sugar malta guiness. Am begging to love that drink but need to know if I should cease the love. first time to comment. i want to confirm this because when i first got the UK, i got addicted to Diet coke. i found that i urinate up to 15times in a day. i was forced to take a test where i was diagonise of TYPE 1 diabetics. i choose diet coke believing it contain no sugar. i can confirm, this product increases the risk of diabetics more than anything in the world. pls reader beware. Lilly I am so so happy to see this beautiful topic. Last year I bought ãήϑ read THE HALLELUYAH DIET by George Malkmus who recently visited Nigeria. This is a man that Cancer runs i̶̲̥̅̊n̶̲̥̅̊ his lineage,it killed his mum ãήϑ when it got to him he discovered that giving up all these junks helps keep alive. Today he's 100% cancer free. Its not easy to do 100% as I've tried but i̶̲̥̅̊n̶̲̥̅̊ 6months I gave up anything bottled, sugar(I still drink my pap ãήϑ oats without sugar,its all about taming ur taste bud) even milk which was hardest ãήϑ the result clearly showed, all those demonic never-going acnes i̶̲̥̅̊n̶̲̥̅̊ my face disappeared, I felt healthier as I started eating more of fruits ãήϑ vegetables. Some time i̶̲̥̅̊n̶̲̥̅̊ my early pregger days Doctor said my PVC was 6 below normal ãήϑ I took to my veggies,drinking ugu(pumpkin leaves) ãήϑ cucumber juice every morning ãήϑ i̶̲̥̅̊n̶̲̥̅̊ 3 weeks my blood increased by 17. it was hard giving up but I allowed myself dictate for my body ђã†̥ it should ãήϑ not eat. Linda this is not a definitive research. When the research is completed come and talk to us. So? So pple shldnt drink? Drink anything u wanna drink ( not that concortion they call Lacasera), but in MODERATION....even the so called natural fruit juice is packed with sugar. The watch word there is moderation. I take diet sodas mayb once in a month, and I bet that's not gonna kill me. However, Linda if u start searching for side effects of drinks and food, I bet u will even stop drinking water, and starve yourself like ur new obsession, Agbani. There are hardly any difference in the calorie content between diet or regular soft drinks. There is enough sugar in them to make you obese and diabetic. Did anyone else lol at the name Fagherazzi? "Fag-her-azz(ss)-i". Lmao! I don"t drink sodas,I drink %100 juice and water instead. We drink it cos we stooopid! Tanx 4 makin us wise Linda. Aaaaaaaah!!... that's it! !...no more fizzy drinks for me. Slow news day, eh Linda? Regular coke/anything is better than Diet coke/anything. Aspartame is a silent killer. Ezems they don't taste the same. Linda, i hav type two diabetes though not fat o (need to lose d extra 20lbs since my baby). I use d accu check meter to check my blood sugar 3 or 4x a day n i take diet pop plenty. It has nvr evr shown on my meter, instead i am much mor cautious of unripe plantain which sends by blood sugar to d sky wenevr i eat it. That is my findin frm checkin my blood sugar so often. More afraid of loosing my enamel than anthin else with diet pop, which is d only reason i hav drastically cut down on dem cos enamel is irreplaceable. Is pepsi & alcoholic beverage???Learner!!! Even though i never drink carbonated or fizzy drinks i always knew there was something quite not right about those so called diet soda's. My suspicions were allayed after i read an article on yahoo 2 years ago about the dangers of diet soda. normal coke is a killer, in Nigeria our coke has 8 cubes of sugar as against 6 cubes of sugar which others have in other countries, then diet coke is worse just made lighter. Nice one Linda. I'm one guilty person wen it comes †̥φ drinking zero calorie carbonated drinkz. Jst 2day i had one myself. I gotta have a rethink, never knew dere were dangers to it.